Dumps of silty sand formed a level surface over the Period 3.1 features for a distance of 14.0m south of the Roman road (Fig. 20). 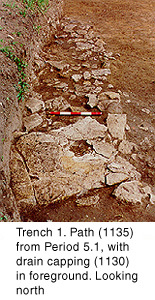 This appears to have been deliberately dumped in order to form a level surface for the construction of one or two substantial timber buildings on masonry footings alongside the Roman road. Four metres to the south-west, part of a similar building was observed (Buildings A and B). The fence line to the rear of the buildings was replaced by a recutting of the ditch (1066; Fig. 21). It was normally about 1.5m wide and 0.4m deep, although it was 2.5m wide and barely 0.2m deep at one point. At the same time or soon afterwards, a path was established between Buildings A and B (Fig.34). It comprised layers of pebbles and limestone fragments set in sand. It also incorporated patches of pottery sherds from massive shell-tempered storage jars, which were apparently repairs to the path. The path extended from the Roman road southwards, between Buildings A and B, before turning south-south-west (97, 1135, 2030, 2032-4, 2037-41, 2043, 2060 and 2064). A culvert at least 3.0m long was constructed in ditch 1066 to carry the path over it. The culvert comprised limestone blocks supporting capping stones approximately 0.85m square (176 and 1130) (Figs.35 and 36). In Trench G, a probable beam slot (236) ran southwards for 7.4m from the culvert. It could represent a fence that formed the western limit of the path, or was perhaps part of a building that incorporated the culverted drain. 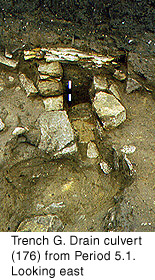 Cut into the Period 4.2 infill of the low-lying area were several features, including a partially excavated well with convex sides (1275). Post-pits 1141 and 1185, north of the well, may represent a fence, aligned east-west. Immediately south-west of 1275 was a small sub-rectangular pit (1075). In Trench 3, post-pits and probable beam slots indicate that a timber structure, probably a building, was constructed over the backfilled Period 4.6 ditches (Building F). To the east of this possible structure was 3002. This ditch was aligned north-south and was at least 2.0m wide. About 2.0m north of ditch 95 was a surface of limestone fragments and gravel, set in sand (277), which extended for at least 5.0m to the north end of Trench I. A spread of chalk gravel and limestone fragments beneath it may have been a bedding layer (278). This was probably a path or yard surface, or (less likely) a floor within a timber building. These features may represent one or more buildings, associated with a path that connected with the road to the north. The pottery evidence suggests that this activity took place during the later 3rd century. 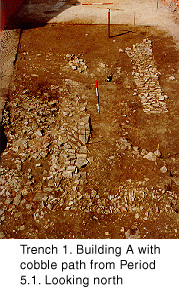 It may have been contemporary with the Period 5.1 roadside structures in Trench 2.